Although traveling significant distances is routine for many Princetonians these days, traversing North America was not always as easy as it is now. Our records reveal a variety of both academic and pleasure trips over the years that have used horses, trains, cars, and bicycles to reach their destinations. The first Geological Expedition took its participants (18 students and two professors) further into the American west on an 11-week trek to Colorado, Wyoming, and Utah in the summer of 1877. Three Princeton juniors (William Berryman Scott, Henry Fairfield Osborn, and Francis Speir) had taken a geology course with Arnold Guyot and had read reports about fossil-collection trips Yale had taken. They were determined that Princeton should not be left out of these types of adventures and convinced others to join them. The Princeton Scientific Expedition camping out at Fairplay, Colorado, in the summer of 1877. Princeton Scientific Expeditions Collection (AC012), Box 3, Folder 2. The senior thesis, the capstone of a Princeton student’s academic experience, has moved further into the 21st century with Thesis Central, a new thesis collection and management tool. Working closely with the Office of Information Technology and the Office of the Dean of the College (ODOC), the Princeton University Archives launched the site on Monday, March 27 in order to begin collecting the theses that are due during the months of April and May. Courtney Perales ’17, Anthropology. Thesis Due: April 17. Seniors will log into the system with their NetIDs, with much of the necessary information pre-populated into the collection form. In fact, seniors will only need to do three or four things after logging in: provide their thesis titles; upload the thesis files (and any supporting files such as datasets or videos); affirm they followed University rules regarding the work; and, if their department requires one, cut and paste their abstracts. Students are also provided a link to the ODOC page should they wish to request any type of restriction. Antoine Crepin-Heroux ’17, Electrical Engineering. Thesis Due: May 8. See the Mudd Library website for detailed information about the new submission process. The University Archives has launched an online archive of senior theses, and now there are new ways to search for, find, and view Princeton University senior theses. Theses created between 1924 and 2012 are in paper format or on microfiche, and can only be viewed in the Mudd Manuscript Library Reading Room. All senior theses created in 2013 are in PDF format, but they are only viewable in full text at the computers in the reference room of the Mudd Library (i.e. “Walk-in Access”). You do not need to request 2013 theses prior to visiting the library. To see the listing for 2013 theses, visit the Senior Thesis Community page. Further DataSpace search tips follow. All 2014 and later senior theses are in PDF format, and most are accessible on any computer connected to the Princeton University network. A small number of theses are subject to temporary restrictions (embargo) or are restricted to computers in the reference room of the Mudd Library (i.e. “Walk-in Access”). To search for 2013, 2014 (and future) theses, visit the Senior Thesis Community page in DataSpace. Use the search box to enter the author’s name, the title, or keywords. You can limit the search to a specific department by using the dropdown box labeled “In”. Use the Browse button “Author” to see an alphabetical list of authors in the system. Then click on a name to see an author’s thesis. The Browse button “Author” lists thesis authors as well as advisors in a combined listing. To find the name of an advisor, click on the Author button and scroll to the advisor’s name in the alphabetical listing, then click on the name to see the theses advised by this person. Please note, there may be multiple forms of name for each advisor, so check under each of the name entries for that individual (e.g. “Anthony Grafton,” “Anthony T. Grafton,” “Anthony Thomas Grafton”) to find all of the theses that this person advised. 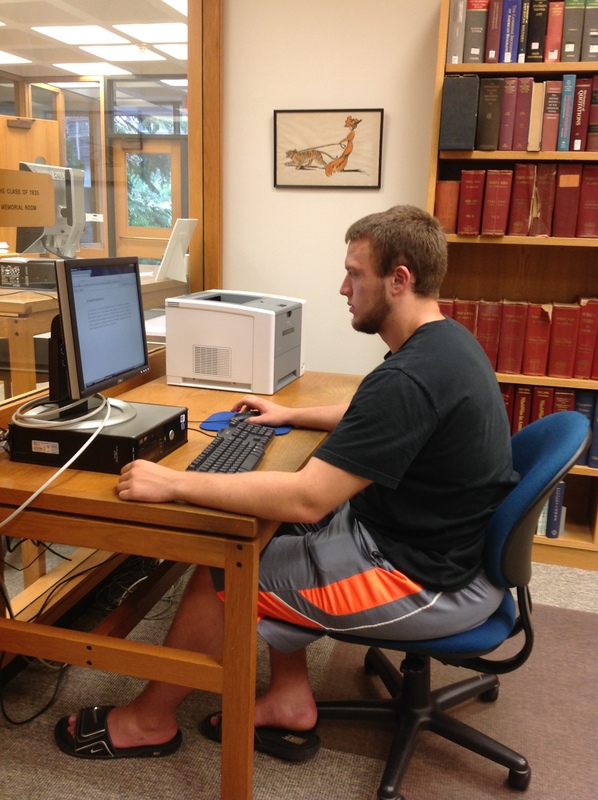 Princeton University student, Mason Darrow, views a senior thesis at Mudd Library. The University Archives made the transition from collecting paper theses to theses in digital format (PDFs) to broaden accessibility of senior theses within the Princeton community. The Senior Thesis Collection is the most frequently used collection at the University Archives and, as such, are consulted by Princeton students at a rate of about 1,000 per year to explore topics, gather ideas for possible faculty advisers, find sources, gain familiarity with disciplinary writing styles, develop research methodologies for their own theses, and to generally understand what makes a good thesis. The DataSpace repository also has the capability to capture and deliver multiple file formats including text, video, audio, and image files. While most theses will be available in full-text on all Princeton-networked computers, a small number will only be available at computer terminals in the Mudd Manuscript Library, and none will be directly accessible to the general public. Senior theses submitted in 2012 and before will continue to be available in paper format at the Mudd Manuscript Library. For more information on the Senior Thesis Collection, contact mudd@princeton.edu. UPDATE, June 2, 2014: Class of 2013 Senior Theses are now available for viewing and download at the public computers at the Mudd Manuscript Library. Class of 2014 Senior Theses will be available throughout the Princeton University network by September 2014, with the exception of a small number of theses that are temporarily restricted, or limited to the Mudd Manuscript Library public computers. UPDATE, October 18, 2013: At the request of the Office of the Dean of the College, access to the PDF files is temporarily suspended. Those seeking copies of 2013 theses should visit the Mudd Manuscript Library to obtain access to the theses. We will need users to provide the author’s name and department. The Class of 2013 senior theses are now available on DataSpace at Princeton University. Senior theses are accessible in full-text, digital format from any Princeton-networked computer. Theses can be searched using text (such as the author’s name, advisor’s name, or words in the title), or browsed by author, department, or title. Searching and browsing can happen at the collection level (Senior Thesis collection) or at the department level (e.g. English Department). Researchers will still need to come to the Mudd Manuscript Library to view theses created before 2013. In the coming weeks, however, the data from the Princeton University Catalog of Senior Theses will be migrated to DataSpace so all of the theses can be searched from a single interface. In due course, senior theses will be searchable in Books+. There are no plans to systematically digitize 2012 and earlier theses at this time. Access to senior theses for researchers outside of Princeton University remains unchanged regardless of when the thesis was created or its format—a copy may be ordered by submitting a written request to the University Archives. The creation of the digital archive of senior theses is a joint project between the Office of the Dean of the College, the University Archives at the Mudd Manuscript Library, and the Office of Information Technology. Its intent is to broaden accessibility to senior theses within the Princeton community, as Princeton seniors consult them at a rate of about 1,000 per year to explore topics, gather ideas for possible faculty advisers, find sources, gain familiarity with disciplinary writing styles, develop research methodologies for their own theses, and understand what makes a good thesis. The archive also has the capability to capture and deliver multiple file formats including text, video, audio, and image files. For more information on senior theses, please contact the Princeton University Archives at 609-258-6345 or mudd@princeton.edu. Access to the most frequently used collection at the Mudd Manuscript Library—the Senior Thesis Collection—will be greatly enhanced in 2013 as we transition from collecting paper copies to electronic copies (PDFs) of theses. Dean of the College Valerie Smith has approved a plan for senior theses to be available online (but limited to the Princeton University community) through Princeton’s digital repository, DataSpace. To this end, next summer DataSpace will become the main search interface for all theses. Senior theses submitted in 2013 and in the future will be available only electronically (but limited to the Princeton University domain), while senior theses submitted in 2012 and before will be available in paper format at the Mudd Manuscript Library, as they are today. In the second phase of the project, PDFs of legacy senior theses will be added to DataSpace as they are scanned for patrons, which will incrementally grow the number of theses available digitally. The submission process for academic departments will evolve as we move to PDFs—all of the data entry and uploading will be done through a simple online form. Staff in the academic departments will do the initial data entry and uploading, and Library staff will make a final check and then release the theses to DataSpace. Training on the new process will be offered in the winter of 2013 and will include online videos as well as in-person demonstrations at the Mudd Manuscript Library. Questions about the new process can be directed to the University Archivist, Dan Linke (609.258.5879; mudd@princeton.edu).